A baby travel system is designed to cover your baby's transport needs, and they're often a cost effect method of purchasing both a stroller and matching car seat at the same time. Despite the fact most of us go on to raise a family, few of us allow our lives to grind to a halt. Instead we tend to blend parenthood with life-before-baby, and somehow the two aspects of our lives tend to work in synch. Or at least that's the plan. This is where things like strollers and car seats come into play. Two important pieces of baby gear that most of us would struggle to be without. A travel system is designed to allow you and your baby to discover the world together. Between the stroller and the baby car seat, the only thing holding you back is time ... how much you have that's free to spend out and about, taking in the sights and sounds of the world around you. In recent years, these stroller/baby seat combo's have become more streamlined, more accessible and many are now more affordable than ever before. There's a wide variety of choice and combinations - color, design and function have become a part of the overall focus. Different manufacturers compete for the biggest slice of the profit pie - which is great for us ... because their efforts to improve strollers and car seats means that our babies and our pockets are the benefactors! 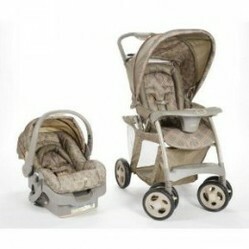 This is the best selling travel system - and comes from the well loved Chicco brand name. The range of features include a simple but effective braking system, full suspension on all four wheels, a three positioning leg rest, reversible canopy and much more. For the price tag you're getting a whole box of good stuff in one complete travel unit for a baby - it's an awesome package and there isn't one single real issue with the design, details or quality of manufacture. The wheels will still be going strong years after your baby's outgrown it, the play tray is solid, the basket is plenty big enough - and the car seat delivers on safety, comfort, looks and function. Amazing system with an amazing price, and one that both of us agreed on as being a great value for money product. This is a Gracco travel system - and it's also one of the best examples overall. At just under 170 dollars you're getting a lot of value for your money. 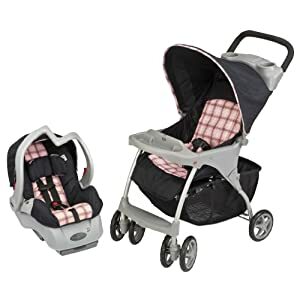 It includes a sturdy, well made stroller that's up to a high standard and a matching car seat that meets with all current safety regulations. The car seat itself is a top rated unit across baby related media and will carry a baby up to 22 lbs. Rear facing, with fully washable trendy covers, and padded where it's needed the most. 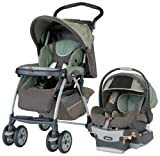 The stroller is superior for the price - it carries a child up to 40 lbs, one handed folding mechanism, spacious storage basket, parent tray, plus baby gets a multi reclining seat and a functional play tray. An awesome deal all round, especially in view of the quality, safety features and overall appeal. If you're on a budget, then this is the best of the cheap travel systems. It's an outright winner, in terms of price, quality and function and comes in at a little over 120 dollars. You're getting a surprisingly good quality travel system for your money, and it certainly does more than just look good. The car seat has a base that's designed to remain in the car, making switching between car and stroller a nice, easy operation. The car seat is durable, lots of padding and attention to safety standards that mean that baby will get a comfortable and safe ride every time. The stroller covers are tough enough to withstand a growing baby, the seat is multi-positional and the basket is huge. There's suspension on the front wheels, plus they're lockable and the stroller collapses with a one-handed mechanism. A fantastic budget buy, nothing shabby about it, and currently on sale at less than a hundred bucks ... bargain.